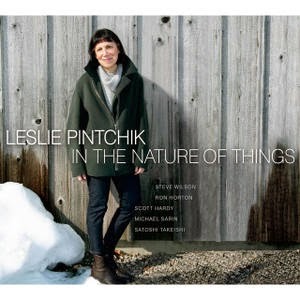 bebop spoken here: CD Review: Leslie Pintchik - In the Nature of Things. Leslie Pintchik came to jazz after first teaching English Literature and receiving a Master of Philosophy degree in seventeenth century English Literature! The lady can read words as well as music! Whilst I'm impressed by all this learnin' stuff, I'm even more knocked out by her pianistic, composing and arranging skills. The compositions are magic, you feel you know these tunes even though you've never heard them before and plagiarism doesn't even enter into it - these are hers and no-one else's! Leslie's interpretation of the one non original, I've Grown Accustomed to her Face, is on a par with the classic Andre Previn version. There are so many names bandied around these days - both here and "across the pond" - that genuine, straight down the middle players, usually immensely more talented than the jazzarati, get overlooked. but also the fine solos by Wilson and Horton. If we operated a 5 star system this would be ****. Leslie Pintchik - In The Nature of Things is available now.